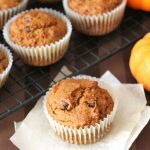 Vegan gluten free pumpkin spice muffins that are so easy to make and SO delicious, you’ll want to make them year-round—not just during the fall! They can also be made just vegan if you aren’t gluten-free! This post was originally published January 5, 2015, images were updated September 2017. When I was in high school, my friend Christa’s mom would bake pumpkin spice muffins, amongst other things (she is a great baker!). I remember being so excited when I’d go over after school and she had just baked a fresh batch. Those muffins were AMAZING, and obviously memorable since I still think of them after all these years. They were spiced perfectly, they were loaded with chocolate chips, and they were my favourite thing to eat when I visited their house. 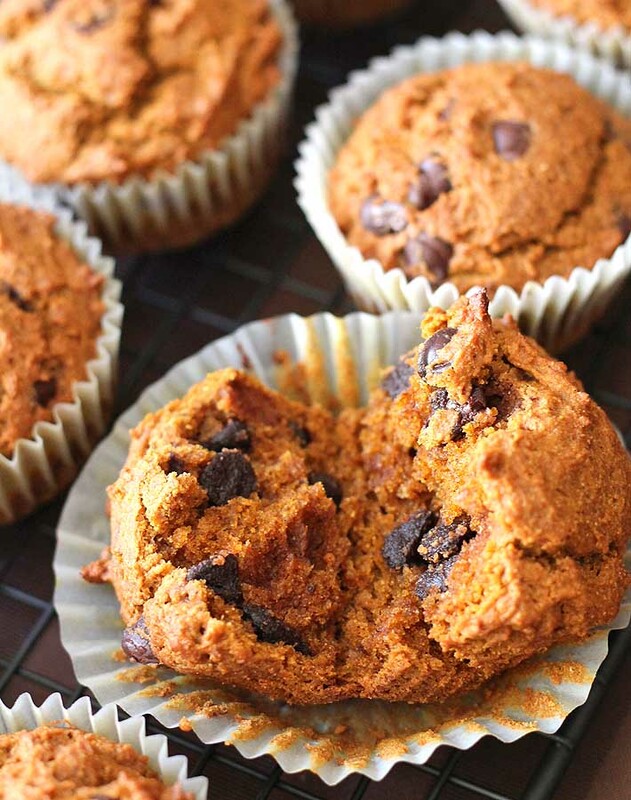 Over the years, I’ve tried to re-create them and I think I’ve hit the mark with these vegan gluten free pumpkin spice muffins. The major difference between these and the pumpkin spice muffins from my high school days is that these are vegan and gluten-free. But you wouldn’t even know it. They’re fluffy, flavourful, perfectly-spiced, and so good, you’ll want to make them ALL THE TIME! If you’re not gluten-free, I’ve got you covered because I’ve tested this recipe with regular, all-purpose flour as well, and that flour substitution works wonderfully. 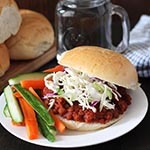 So feel free to try this recipe either way, you can’t go wrong with either version. Because these muffins are a favourite in my home, I make them year-round—not just during the fall. This is all thanks to some smart pre-planning in the fall when I make and freeze a big batch of homemade pumpkin puree (it’s so easy!). You can learn how to do it too, learn How to Make Homemade Pumpkin Puree. When it comes to the add-in for your vegan gluten free pumpkin spice muffins, you can go with either raisins, chocolate chips, or nuts (chopped pecans or chopped walnuts). For the batch in the pictures, I went with semi-sweet chocolate chips, my family’s favourite, but if you do use raisins, try using this raisin trick. If you haven’t baked a vegan recipe before or a vegan gluten-free recipe, you may be wondering what the texture will be like and if it will be different from a non-vegan or non-gluten-free recipe. I hope the picture answers those questions! These muffins turn out soft, moist, and fluffy every time if you follow the recipe as it is written. Just as perfect as any regular non-vegan or non gluten-free muffin. You can also see the video on Facebook so you can share it with your friends or you can pin it on Pinterest to save for later. Note: For those of you who have asked about the scoop I use in the video this is the one I use to put the batter into the muffin pan! And finally, for those wondering about the flax eggs in this recipe, read this post to learn how to make them and everything else you need to know about using them as an egg replacement in vegan baking: How to Make a Flax Egg (A Vegan Egg Substitute for Baking). 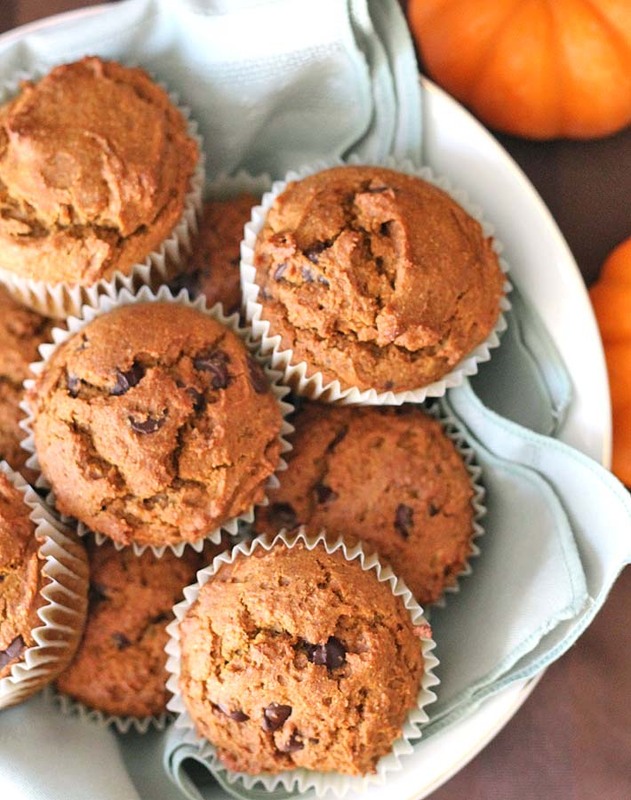 Vegan gluten free pumpkin spice muffins that are so easy to make and so delicious, you'll want to make them year-round—not just during the fall. 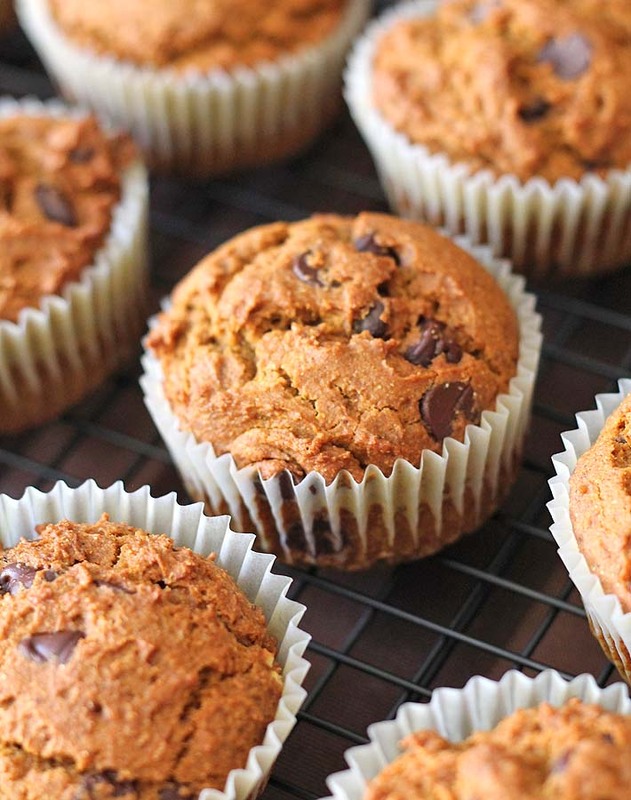 These muffins can also be made with regular flour. I've tested this recipe with all-purpose flour and it works great, so if you aren't gluten-free, you can use regular flour as a 1:1 substitute for the gluten-free flour. Make your own pumpkin puree instead of buying the canned stuff. Click here to see how easy it is and how to do it yourself. 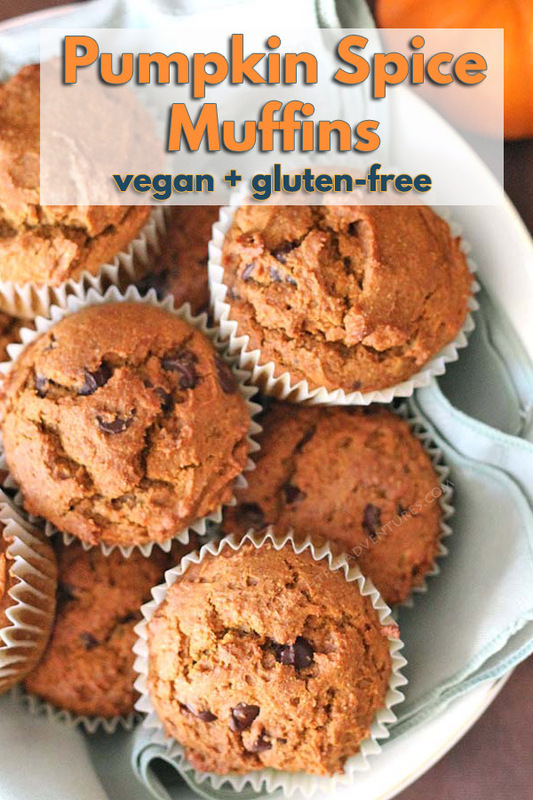 Nutrition info is based on 1 vegan gluten-free muffin made with chocolate chips. Nutrition info is only to be used as a rough guide. Click to learn how nutrition info is calculated on this website. 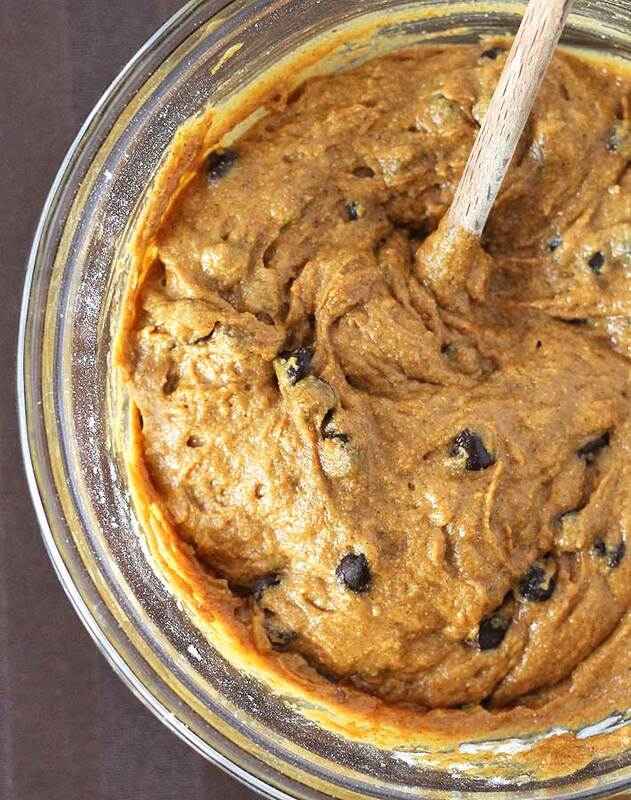 Can’t wait to make these for a fall bake-off I have at my office! They hit all the boxes-gluten free, dairy free, vegan & low FODMAP! I’ll be switching out half of the coconut sugar for brown sugar- hope that works! Question-what type of coconut oil? Should it be refined coconut oil to remove the flavor, or is there supposed to be that coconutty flavor? They were great! The batter was a little thick so I added an extra tbs oil and a couple tbs water. And my oven doesn’t get as hot so I baked them longer. Delicious, not too sweet which I love! I am trying these for the first time tonight. My house smells amazing!!!!! ahh wow <3 I just made a big batch of these using golden raisens as the add-in. They turned out absolutely amazing! beautiful flavor and nice fluffy texture. I was running low on GF flour, so I subbed some of the flour that it calls for for rolled oats. Still turned out perfect! Thank you so much for sharing. My friends at work will love these I bet. Planting seeds of compassion in any way that we can, each and every day. I wish I had co-workers who baked for me 🙂 I’m so happy you like them, Maia! I hope everyone else likes them, too! Thanks so much for your note. When using the Bob’s Red Mill GF Flour, should Xantham Gum be added? Or, does the recipe work OK without it? Thanks so much! Planning to make these today. No problem! I hope you love them 🙂 Let me know how it goes! Hi there, I followed the recipe exactly and mine were dry and didn’t rise into muffin shape. Did I read the ingredients right? 1 and 3/4 cup of flour? Oh my gosh! These are incredible- all for making them vegan and gf but didn’t have coconut sugar or gf flour so I use whole wheat and some maple syrup! YUM!! They are so moist ! Yay! I’m glad you like them, Peyton! Yes, the texture is what I love about these muffins. So good 🙂 I’m glad your substitutions worked well! What if I use a quarter cup of oil instead of half a cup. That’s the only thing that bugged me a bit, the amount of oil. It seems like a bit too much oil. But I guess that’s what makes them taste so good. Ps. I made them once and they were awesome! Just found your blog and can’t wait to make these!! I used unsweetened applesauce instead of oil and they turned out good! They are pretty high in sugar content so if I make them again I will definitely use less sugar. I’m glad to hear you like them, Monica! Good to know that the applesauce works well as a substitute for the oil. Thank you! It’s beginning to look a lot like fall in Texas, so baking is on my mind. A gluten-free recipe is a must for me. In my hurry to smell the scent of fall, I subbed 2 eggs in place of the flax seed “eggs” (only whole flax seeds in the pantry). The batter was dense, but the results were outstanding. Great recipe, but I made some modifications as well. I didn’t realize I had pinned a vegan/gluten free recipe, no offense to vegans! I used regular unbleached flour, veg oil, brown sugar, and 2 eggs. They came out amazing! So your recipe rocks even if you change a few things! Thank you! Just made these with a few substitutions, because I used the ingrediants I have for normal baking. I used the Bob’s Mill Whole Wheat All-Purpose Flour, and I used two farm fresh chicken eggs instead of the egg substitute (we have a lot of chickens), and homemade pumpkin puree. I loved adding in the coconut sugar, its adds such a distinct flavor. Also, I only baked for 16min and they turned out so good and my home smells like fall. ? thanks for a delicious new pumpkin recipe! I’m so glad it worked out well with your substitutions, Becca! Thanks for stopping by and letting me know, your comment will help other readers in case they’re wondering if the recipe will work with the same swaps you made. I’m so happy you like the muffins! And yes, I love baking with coconut sugar too! My family loves these muffins! It’s so hard to find a good recipe that is gluten, egg and dairy free. My son is allergic to all three and it’s been a challenge finding foods that he’ll not only tolerate but enjoy eating. These are a HUGE hit! Thank you so much for the great recipe. I’m going to try your morning glory muffins and oat squares next. So happy to hear this, April! My family loves them too, I make them A LOT 🙂 I’m glad you are able to make something for your son that he both enjoys and can actually eat safely. I hope the Morning Glory Muffins and squares are also a hit, let me know how it goes! I haven’t made them the your way to compare, but I used an egg replacer and avocado oil instead of coconut, and they turned out great! My kids give them two thumbs up! Thanks so much!! I have made these twice now. First time as directed but with an egg instead of the flax seed/water combo. They were tasty but the batter was thick. Second time, I added two eggs and 1/4-1/2 cup coconut milk (from a can). Delicious and perfect consistency to put into muffin cups. Same bake time. Next time I am going to substitute applesauce for the eggs. Thank you for the recipe. It has been a struggle to find gluten/dairy free options that I find yummy. 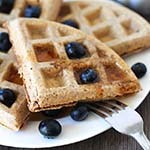 I saw these on Finding Vegan and was shocked that they are vegan and gluten-free! They look perfect!! Sarah, I’m not just saying this because it’s my recipe, but they ARE perfect 🙂 I make them all year long, my kids ask for them all the time. If you make them, I hope you love them too. Thanks for your note and for stopping by! I’m not the best at cooking or baking, so I was elated that these turned out perfectly. The recipe was easy and I’ve made it twice already. 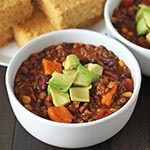 Thanks for circling back to let me know you liked the recipe, Lindsey! I’m so happy to hear they turned out perfectly for you! WOW Gwen!!!! You are crazy good with the camera – my goodness look at that clarity…I could almost reach into my screen for a lovely muffin. Good job girl <3 – can't wait to see more of your stuff! Such an amazing compliment coming from you, Amrita! I love your blog and photography. Thank you so much! These look SUPER yummy! Must try! Let me know how you like them, Danielle!